Kilmarnock came from behind to beat Hibs and ease into the quarter finals of the Co-operative Insurance Cup. The visitors took the lead after eight minutes at Rugby Park when Liam Miller found Jonathan Grounds and the left back's shot found the top corner. But Kilmarnock came roaring back and Jamie Hamill equalised after Conor Sammon's shot had been parried. Hamill fired Killie into the lead from the penalty spot and David Silva clinched the tie in the 74th minute. 90:00+3:06 The referee blows for the end of the match. 90:00+2:32 Ben Gordon sends in a cross, Effort on goal by Daniele Invincibile from just inside the box goes harmlessly over the target. 90:00+1:28 Colin Nish takes a shot. Cameron Bell makes a save. 88:52 Harry Forrester challenges Michael Hart unfairly and gives away a free kick. Michael Hart restarts play with the free kick. 88:34 Paul Hanlon crosses the ball, save by Cameron Bell. 88:19 Unfair challenge on Daniel Galbraith by Liam Kelly results in a free kick. Kevin McBride takes the free kick. 86:34 The referee blows for offside. Direct free kick taken by Cameron Bell. 84:55 Manuel Pascali restarts play with the free kick. 84:55 Substitution Tim Clancy is brought on as a substitute for Alexei Eremenko. 84:55 Free kick awarded for an unfair challenge on Liam Kelly by Liam Miller. 84:07 Inswinging corner taken by Liam Miller, Colin Nish takes a shot. Save by Cameron Bell. 83:46 Booking Manuel Pascali shown a yellow card. 82:59 Michael Hart takes the free kick. 82:59 Booking Ben Gordon is cautioned. 82:42 Booking Alexei Eremenko is shown a yellow card for unsporting behaviour. 82:19 Ben Gordon challenges Michael Hart unfairly and gives away a free kick. 80:42 Francis Dickoh challenges Daniele Invincibile unfairly and gives away a free kick. Alexei Eremenko takes the direct free kick. 79:27 Substitution (Hibernian) makes a substitution, with David Wotherspoon coming on for John Rankin. 79:27 Substitution Daniel Galbraith comes on in place of Edwin De Graaf. 78:55 Substitution David Silva leaves the field to be replaced by Daniele Invincibile. 78:14 Derek Riordan is ruled offside. Cameron Bell takes the direct free kick. 77:40 Substitution Paul Hanlon on for Souleymane Bamba. 76:38 Corner taken by John Rankin, Frazer Wright manages to make a clearance. 76:18 Substitution Mohamadou Sissoko leaves the field to be replaced by Liam Kelly. 73:39 GOAL - David Silva:Kilmarnock 3 - 1 Hibernian David Silva finds the back of the net with a goal from the edge of the area to the bottom left corner of the goal. Kilmarnock 3-1 Hibernian. 72:22 Corner taken by Alexei Eremenko, Header on goal by Manuel Pascali from just inside the area goes over the goal. 72:16 The ball is delivered by Harry Forrester, clearance made by Souleymane Bamba. 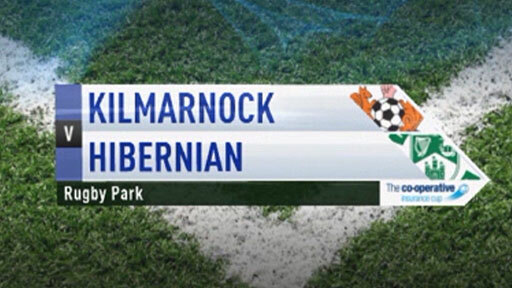 70:20 GOAL - Jamie Hamill:Kilmarnock 2 - 1 Hibernian Placed penalty scored by Jamie Hamill. Kilmarnock 2-1 Hibernian. 69:38 Foul by Francis Dickoh on Harry Forrester, Penalty awarded. 67:31 The ball is delivered by Colin Nish, Manuel Pascali makes a clearance. 66:52 Handball decision goes against Manuel Pascali. Jonathan Grounds takes the direct free kick. 66:32 Jamie Hamill delivers the ball, Michael Hart manages to make a clearance. 66:01 The ball is swung over by Jamie Hamill, Souleymane Bamba manages to make a clearance. 65:19 Derek Riordan has a shot and missed to the right of the goal. 62:08 Centre by Harry Forrester, save by Mark Brown. 61:40 Colin Nish is ruled offside. Cameron Bell takes the direct free kick. 61:30 The ball is swung over by Colin Nish. 60:15 Inswinging corner taken left-footed by John Rankin played to the near post, Colin Nish takes a shot. Clearance by Frazer Wright. 58:41 Alexei Eremenko takes a inswinging corner from the left by-line to the near post, Jonathan Grounds makes a clearance. 58:28 The offside flag is raised against Derek Riordan. Craig Bryson restarts play with the free kick. 57:46 Shot by Colin Nish. Save by Cameron Bell. 56:49 Free kick awarded for an unfair challenge on Souleymane Bamba by Conor Sammon. Mark Brown takes the free kick. 55:54 A cross is delivered by Harry Forrester, Conor Sammon gives away a free kick for an unfair challenge on Francis Dickoh. Direct free kick taken by Mark Brown. 55:04 Shot from inside the six-yard box by Edwin De Graaf goes wide right of the target. 54:55 The ball is sent over by John Rankin. 52:44 The assistant referee flags for offside against Edwin De Graaf. Manuel Pascali takes the direct free kick. 50:33 Edwin De Graaf produces a left-footed shot from just outside the box that goes wide left of the goal. 49:40 Inswinging corner taken by Derek Riordan, clearance by Conor Sammon. 49:12 Centre by Kevin McBride. 46:21 Free kick awarded for a foul by Francis Dickoh on Conor Sammon. Craig Bryson takes the direct free kick. 45:00+1:05 The players leave the pitch at half time. 44:02 Jonathan Grounds crosses the ball. 43:12 A cross is delivered by John Rankin, Foul by Colin Nish on Manuel Pascali, free kick awarded. Direct free kick taken by Cameron Bell. 42:34 Frazer Wright challenges Colin Nish unfairly and gives away a free kick. Derek Riordan takes the direct free kick. 41:47 Foul by Edwin De Graaf on Alexei Eremenko, free kick awarded. Alexei Eremenko takes the free kick. 38:05 Alexei Eremenko produces a right-footed shot from just outside the box that misses to the right of the net. 37:43 The ball is crossed by Conor Sammon, save made by Mark Brown. 37:18 Manuel Pascali gives away a free kick for an unfair challenge on Kevin McBride. Direct free kick taken by Kevin McBride. 36:36 John Rankin takes a inswinging corner from the right by-line played to the near post, clearance by Craig Bryson. 34:56 Edwin De Graaf is flagged offside by the assistant referee. Cameron Bell takes the direct free kick. 33:42 Alexei Eremenko takes a shot from just outside the penalty area which clears the crossbar. 33:01 Jamie Hamill restarts play with the free kick. 33:01 Booking The referee cautions Souleymane Bamba for unsporting behaviour. 32:49 Souleymane Bamba gives away a free kick for an unfair challenge on Conor Sammon. 32:01 Jamie Hamill fouled by John Rankin, the ref awards a free kick. Jamie Hamill restarts play with the free kick. 31:26 Manuel Pascali fouled by Colin Nish, the ref awards a free kick. Free kick taken by Manuel Pascali. 31:06 Long distance effort from Craig Bryson misses to the left of the goal. 30:08 The referee blows for offside. Direct free kick taken by Cameron Bell. 28:17 Conor Sammon provided the assist for the goal. 28:17 GOAL - Jamie Hamill:Kilmarnock 1 - 1 Hibernian Jamie Hamill gets on the score sheet with a goal from the edge of the area to the bottom left corner of the goal. Kilmarnock 1-1 Hibernian. 27:02 Direct strike on goal from the free kick comes in from Derek Riordan, save by Cameron Bell. 27:02 Booking Mohamadou Sissoko shown a yellow card. 26:44 Mohamadou Sissoko challenges John Rankin unfairly and gives away a free kick. 25:56 Foul by Francis Dickoh on Conor Sammon, free kick awarded. Manuel Pascali restarts play with the free kick. 25:19 Free kick awarded for an unfair challenge on Kevin McBride by David Silva. Direct free kick taken by Mark Brown. 24:53 Shot by Derek Riordan. Frazer Wright gets a block in. 24:04 Corner taken by Alexei Eremenko from the left by-line to the near post, John Rankin makes a clearance. 22:59 Jonathan Grounds crosses the ball. 22:40 Edwin De Graaf takes a shot. Cameron Bell makes a save. 21:08 The ball is swung over by Alexei Eremenko. 20:47 Short corner taken by Alexei Eremenko. 20:30 Harry Forrester takes the chance to get an effort at goal. Save made by Mark Brown. 19:10 Colin Nish concedes a free kick for a foul on Manuel Pascali. Free kick taken by Craig Bryson. 18:57 Headed effort from deep inside the penalty area by Conor Sammon goes harmlessly over the crossbar. 18:23 Alexei Eremenko takes the direct free kick. 18:23 Booking Jonathan Grounds booked. 18:10 Unfair challenge on Harry Forrester by Jonathan Grounds results in a free kick. 16:17 David Silva fouled by Edwin De Graaf, the ref awards a free kick. Direct free kick taken by Craig Bryson. 15:30 David Silva concedes a free kick for a foul on Michael Hart. Michael Hart takes the free kick. 14:52 The ball is sent over by Ben Gordon, Conor Sammon has an effort at goal from close in which goes wide of the left-hand upright. 13:04 Alexei Eremenko delivers the ball. 11:58 The referee blows for offside. Direct free kick taken by Cameron Bell. 11:17 John Rankin takes a shot. Save made by Cameron Bell. Corner taken left-footed by John Rankin from the right by-line, save made by Cameron Bell. 9:40 Free kick awarded for a foul by Edwin De Graaf on Ben Gordon. Direct free kick taken by Manuel Pascali. 9:30 Free kick awarded for a foul by Kevin McBride on Frazer Wright. Frazer Wright takes the free kick. 7:20 Liam Miller provided the assist for the goal. 7:20 GOAL - Jonathan Grounds:Kilmarnock 0 - 1 Hibernian Jonathan Grounds finds the back of the net with a goal from just inside the area to the bottom right corner of the goal. Kilmarnock 0-1 Hibernian. 7:05 Kevin McBride crosses the ball, Harry Forrester manages to make a clearance. 6:37 Free kick awarded for an unfair challenge on Derek Riordan by Manuel Pascali. Derek Riordan takes the direct free kick. 3:24 Free kick awarded for a foul by Harry Forrester on Kevin McBride. Direct free kick taken by Mark Brown. 2:25 Colin Nish is flagged offside by the assistant referee. Free kick taken by Cameron Bell. 0:47 Shot from long distance by John Rankin misses to the right of the goal.